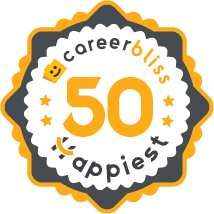 On average, employees at Intel give their company a 4.1 rating out of 5.0 - which is 8% higher than the average rating for all companies on CareerBliss. The happiest Intel employees are Manufacturing Specialists submitting an average rating of 5.0 and Maintenance Technicians with a rating of 4.9. "It's simple, it is easily the greatest company I have ever worked for. Great work environment, great compensation and benefits." "This is by far the best company I have worked for in my 20 year career. It takes very good care of its employees starting with hiring, development and even retirement/redundancy. When the Intel Cavite factory was closed down, thousands of employees were taken cared of through change management, career options (competitors were invited to hire Intel employees), entrepreneurship, alternative careers, migration etc." "I worked as an intern with Intel and my experience has been good. There is freedom to explore your own ways and means of getting stuff done. Con - It took me a month for my team to get me up to speed with the current projects; left me with only 1.5 months to actually accomplish relevant work." "I've worked for Intel for about a month now. It's a nice place to work with really nice work culture and some exciting work to do! People here are really friendly and there's no pressure and there's space for creative growth!" "Good place to work. There are really smart people there that you can learn a lot from." "I've worked for Intel the past 2 years, it is a great place to work, there are endless opportunities." "Very good environment and improve knowledge." "Great technology company. The location I relocated to was not ideal and the coworkers were not so welcoming to new hires. I would work for the company again if given the opportunity but would choose a different location." "I have worked for Intel Corporation for over 14 years. It is a very good place to work and they treat their employees well. I would recommend this company to others who are considering Intel for a place of employment." "I believe Intel is doing the best to drive new innovation forward with new ideas and goals that will benefit the future of technological advances. Being apart of this effort is a great opportunity to gain and learn from. However like any corporation, things are always changing and that means the company will have to cut back on budget." "Great experience with company itself. It is always busy and everyone is always running around keeping the environment active. Good way to understand the flow of the market and technical progression. Of course, this a contract position so growth can be hard. But it's a great opportunity to be a part of the industry." "It was a great place to work. Currently undergoing integration with Intel. Step-child mentality running ragged throughout the company and low office morale. Worst part is -- Intel took our technology and cut our jobs." "Intel is great place to work, you have a lot of control over your own career within the company. Most of the managers that I worked for cared about their employees and did a good job. Had they not closed the site where I was working I would still be there. I would not hesitate to recommend Intel as an employer."